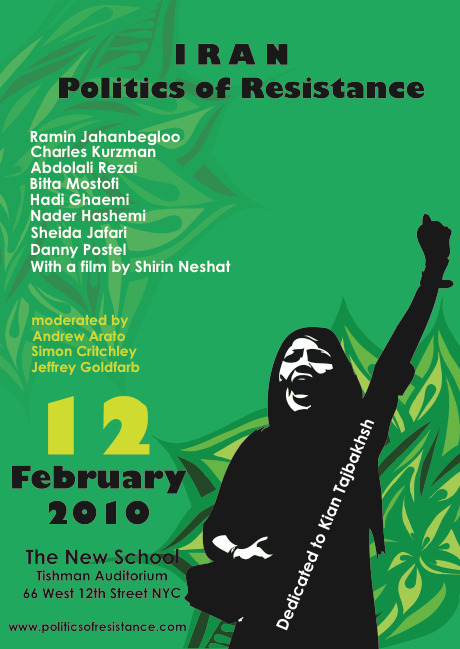 Just over a week ago, I was fortunate enough to attend a conference at The New School called “Iran: Politics of Resistance.” Many great scholars on Iran, both American and Iranian, took part in three panel discussions throughout the day. I was only able to attend the first one—which focused primarily on the Green Movement and whether it can accurately be called a full-fledged revolution—but the others looked to be just as fascinating. Fortunately, they are now all online. From the first panel, I recommend watching Charles Kurzman from the University of North Carolina speak about “Cultural Jiu-Jitsu and the Iranian Greens,” as well as the talk on “Revolutionary Prefigurations” given by journalist Danny Postel (a good friend of this site). His suggestion that the Green Movement not put off addressing economic issues (like the “color revolutions” of Eastern Europe) was met with serious debate during the Q&A period—a phenomenon we are familiar with on this site. It was also nice to hear a lot of our hunches about the ambiguity of the Green Movement’s objectives and leadership echoed by the speakers. I plan on watching both and will add comments if anything strikes me. I hope others will join me.